Family of Wong You, Middleborough, MA, photograph, c. 1921. 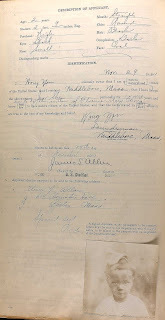 Elizabeth Wong, Wong Nen Hi [Sue Wong], Philip Francis Wong. 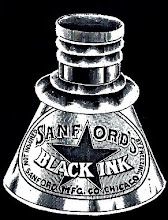 Photograph published by kind permission of M. K. Wong. 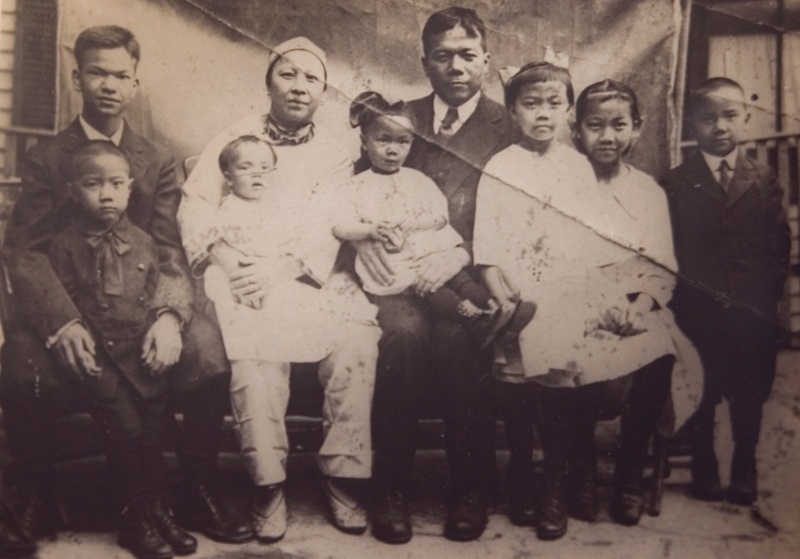 The Wong family was Middleborough’s first Chinese nuclear family, previous Chinese immigrants having consisted solely of single men or married men whose wives and children were forced to remain behind in China because of restrictive American immigration policies. 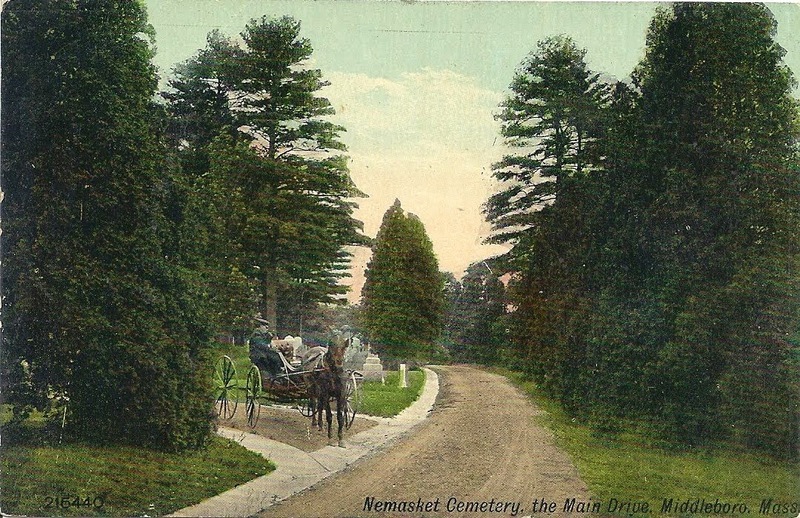 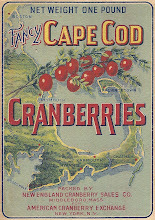 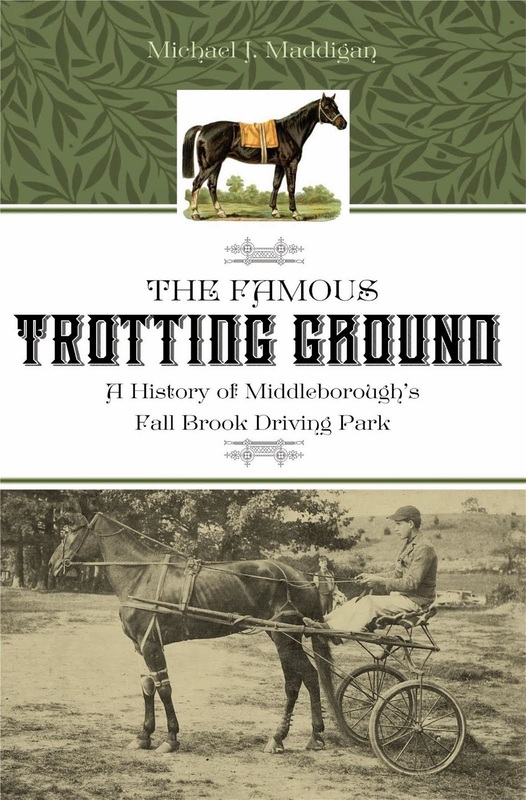 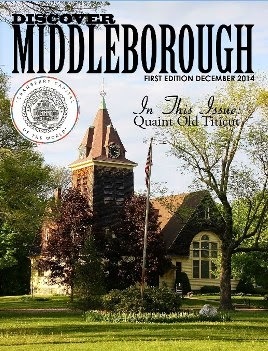 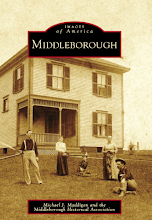 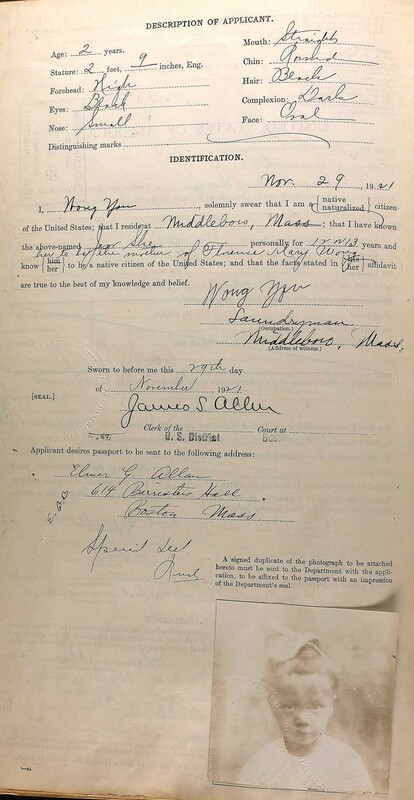 The Wong family resided in the Middleborough and Lakeville area from as early as 1913 when Elizabeth Wong was born at Middleborough through 1921, during which time Wong You was engaged as a laundryman in the establishment of Wah Lee on Center Street. 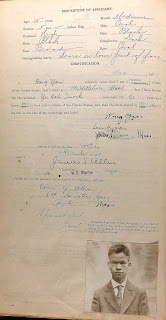 The Wong children attended local schools as did Wong’s nephew Yee Wah Quock who is probably identical with the E. Wah Lee recalled by the late Lyman Butler as a classmate, and the family quickly began to become assimilated into American society and culture. 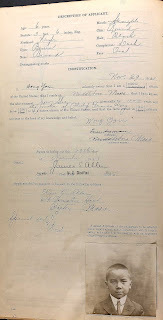 (Note in the photograph that all members of the family except Jew She appear in American dress). 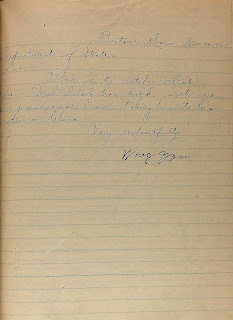 Wong You may in fact have been disconcerted that the assimilation of the family was too rapid, and that the family was losing its ties with its Chinese heritage. 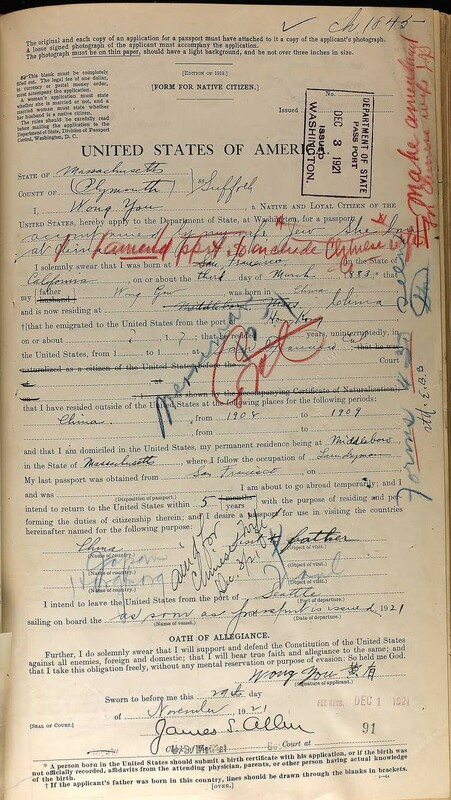 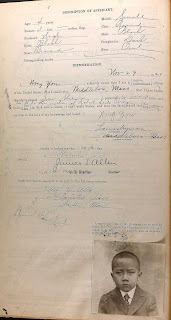 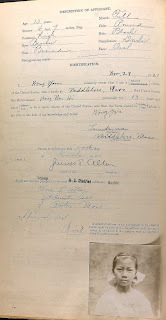 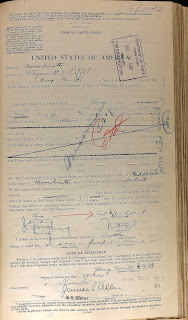 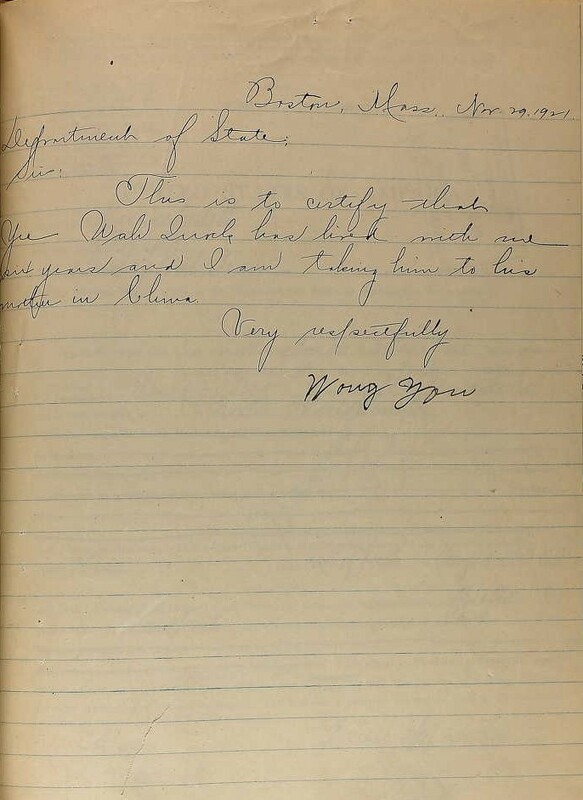 Accordingly, in November, 1921, Wong You applied for passports for his children Nen Hi [Sue], Elizabeth, Philip, Robert, Florence and William and nephew Yee Wah with the intention of departing from Seattle “as soon as passport is issued.” The object of the visit, as listed on the passport applications, was to visit Wong You’s father in China. 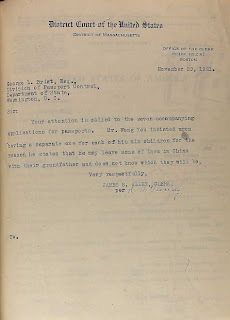 Family recollections, however, indicate that Wong You wished to have the children educated in China which is supported by the fact that at the time application was made, Wong You insisted upon individual passports for each child, “as he may leave some of them in China with their grandfather”. 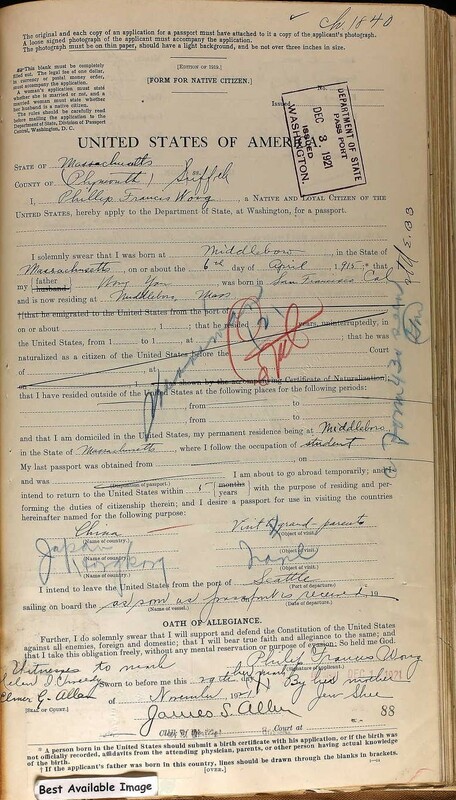 All except one of the children eventually returned to the U. S., with some such as Philip travelling a number of times between China and the U. S. with trips noted in 1931, 1938 and 1940. 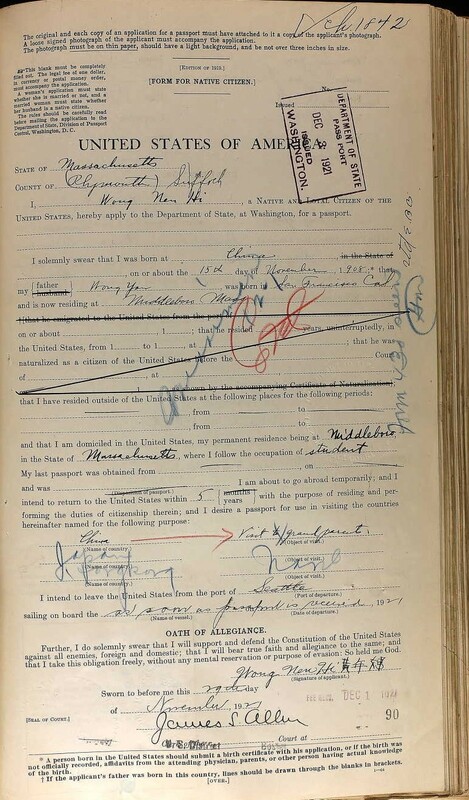 The experience of Wong You's family illustrates the strong family and cultural ties many immigrant, first and second generation-Chinese maintained with China, including frequent visits home where they visited relatives, pursued new economic or educational opportunities, or remained permanently following a residence in America, an important aspect of the Chinese-American experience largely overlooked by scholarship. 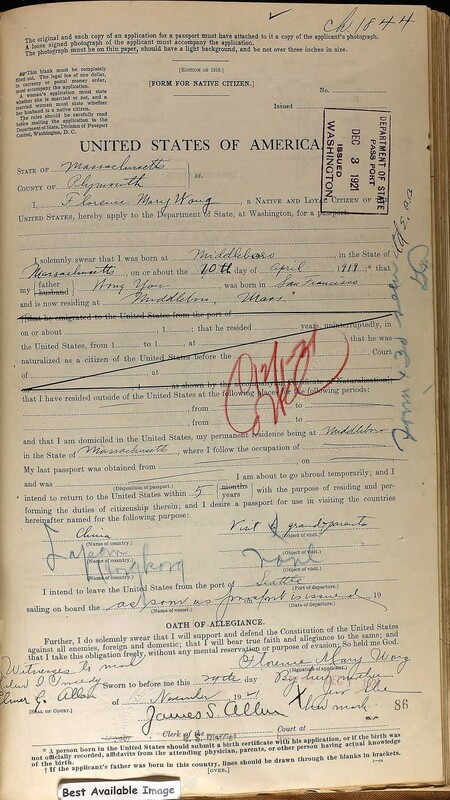 Wong You and Jew She, U. S. Passport Application, November 29, 1921. 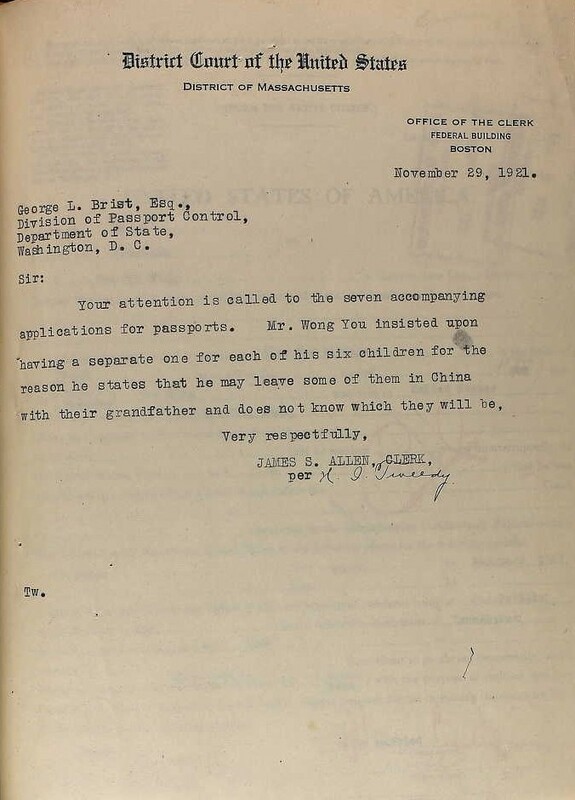 Letter dated November 29, 1921, in which a U. S. passport official explains Wong You's request for individual passports for his children. 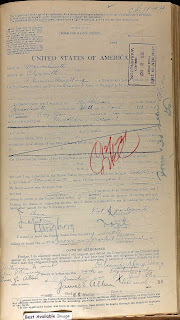 Wong Nen Hi, U. S. Passport Application, November 29, 1921. 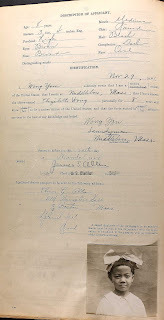 Note that she signed her name in both English and Chinese. 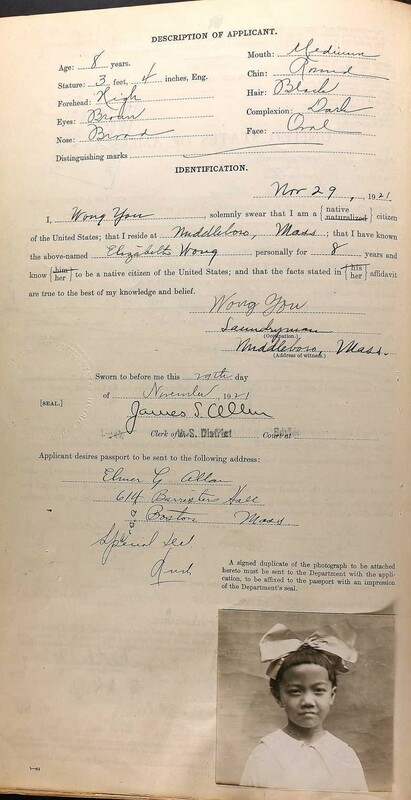 Elizabeth Wong, U. S. Passport Application, November 29, 1921. 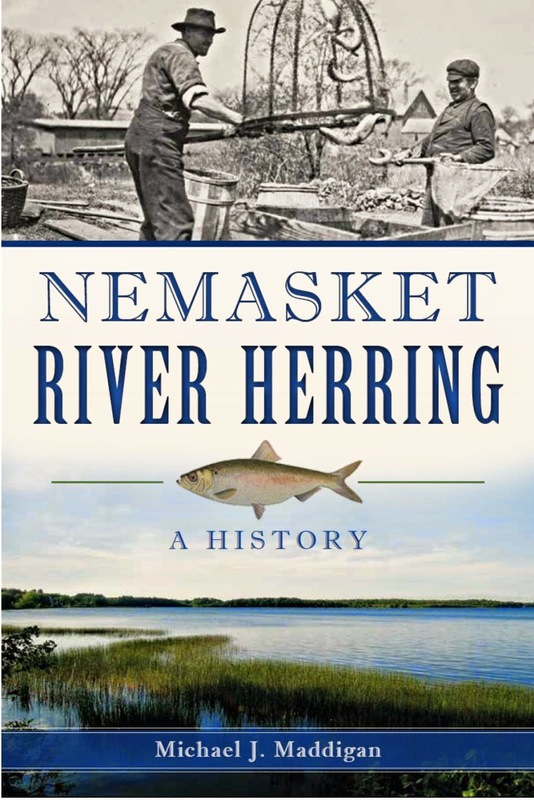 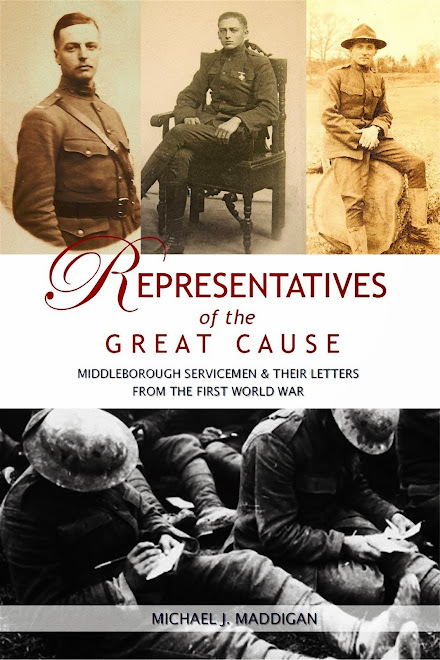 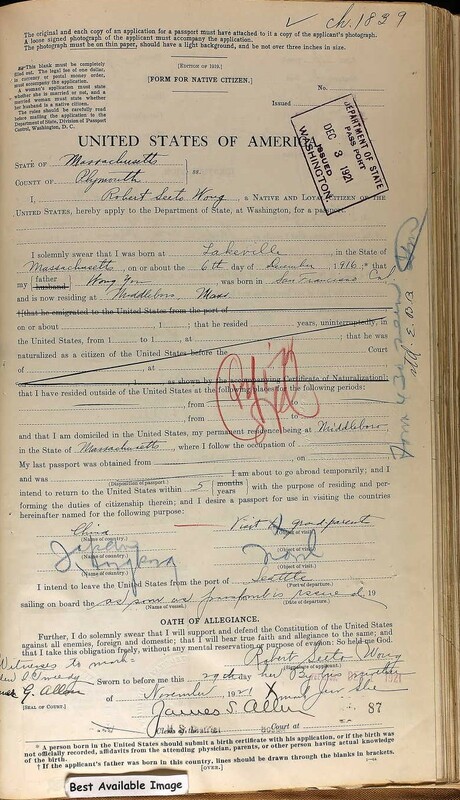 Like her sister Wong Nen Hi, Elizabeth Wong signed her name in both English and Chinese, indicating that despite attending Middleborough schools, the children were still being educated in Chinese in the home. 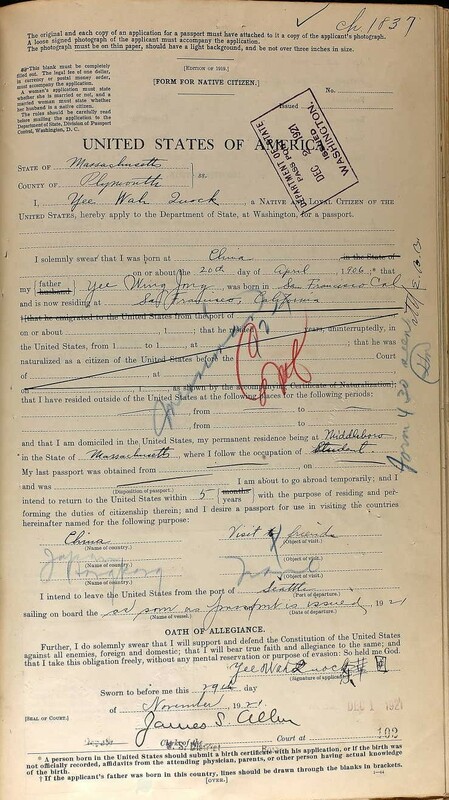 Philip F. Wong, U. S. Passport Application, November 29, 1921. 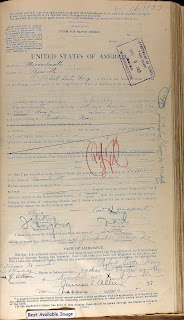 Robert S. Wong, U. S. Passport Application, November 29, 1921. Florence M. Wong, U. S. Passport Application, November 29, 1921. 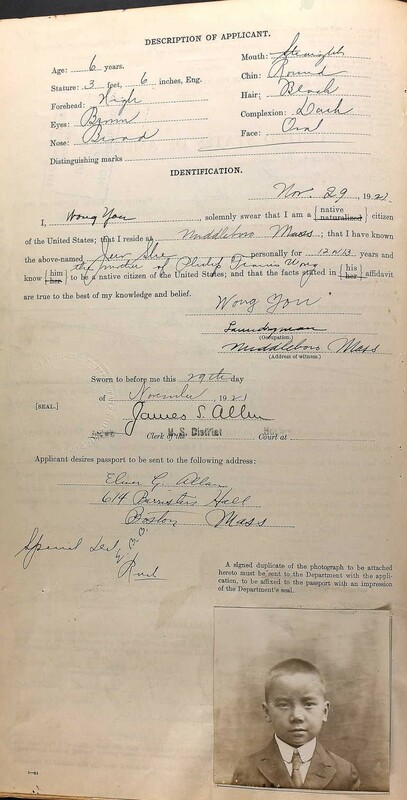 William H. Wong, U. S. Passport Application, November 29, 1921. 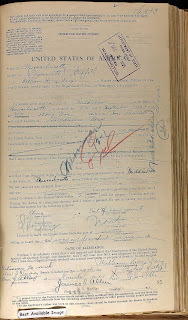 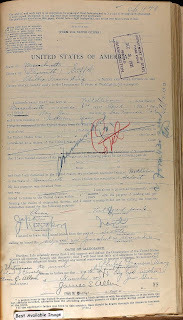 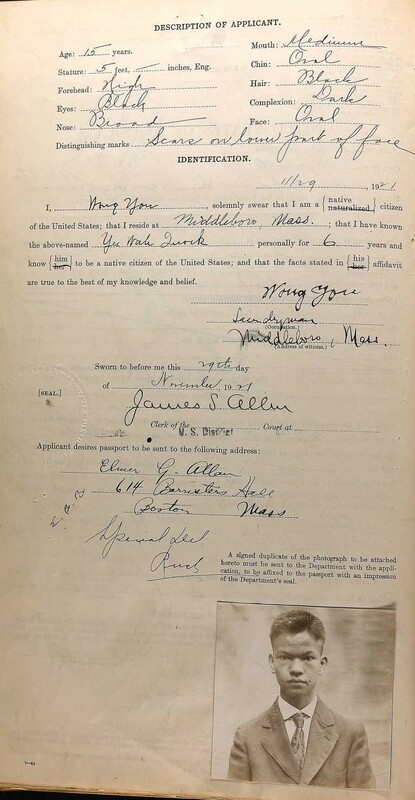 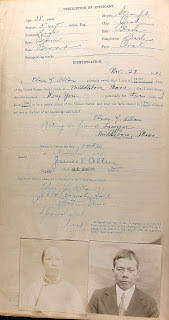 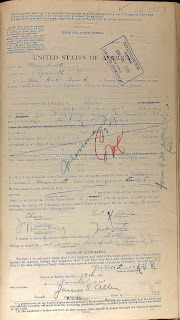 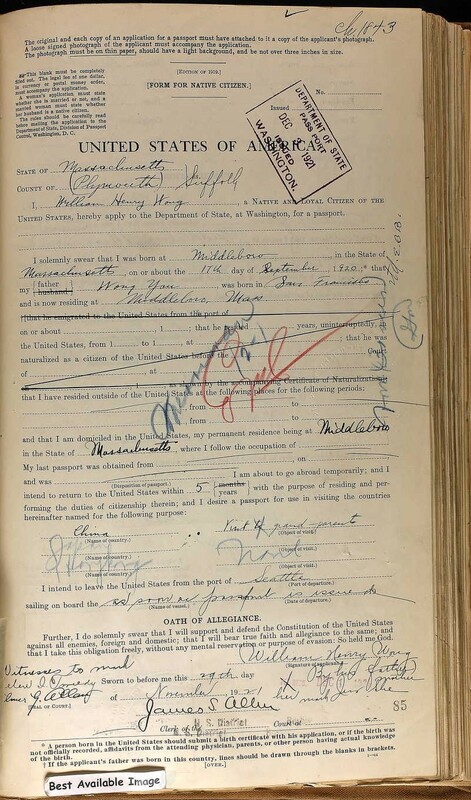 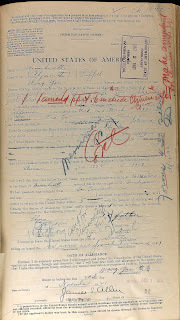 Yee Wah Quock, U. S. Passport Application, November 29, 1921. 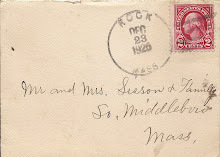 M. K. Wong, correspondence, July-August,2011. 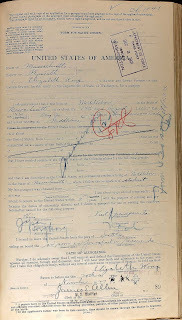 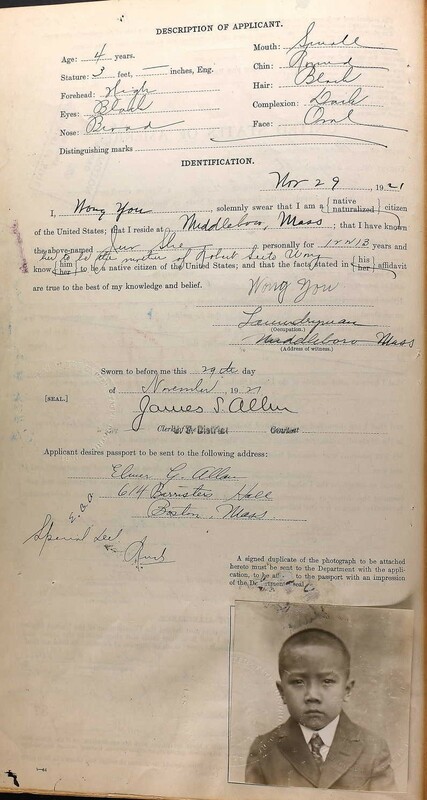 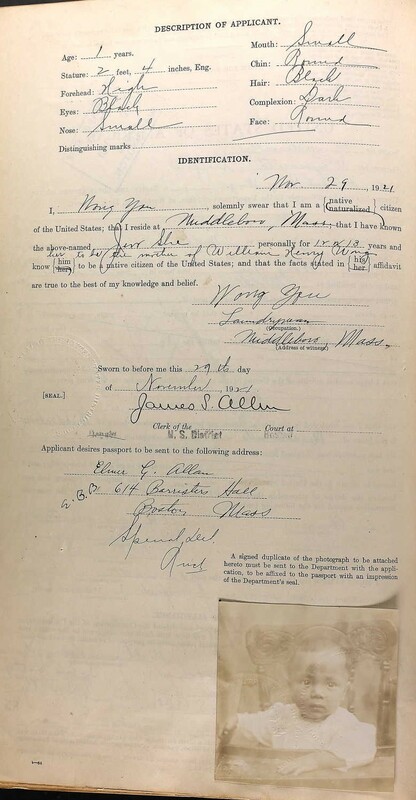 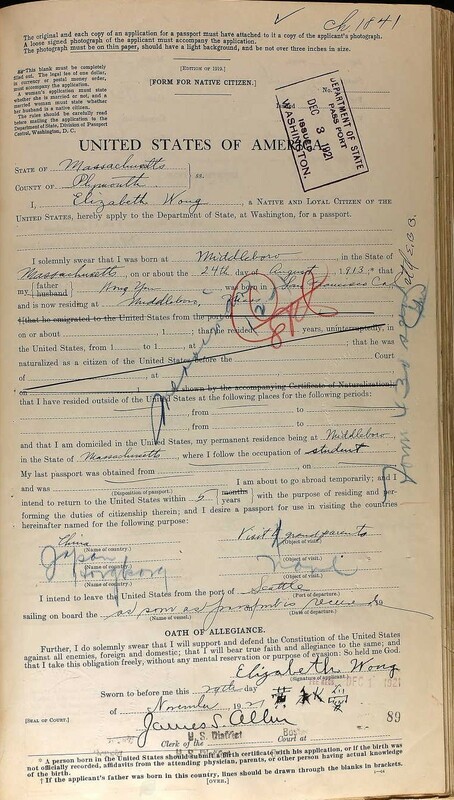 National Archives and Records Administration (NARA), Washington D.C.; Passport Applications for Travel to China, 1906-1925; ARC Identifier 1244180 / MLR Number A1 540; Box #4463;Volume #50.